P H O G S ! PHOGS (PHysics dOGS) is a cooperative local multiplayer double ended dog minigame collection. The three of us started making the prototype in Unity and have the basic mesh generation and physics working. The double-ended dog is controlled by two players using two halves of a controller. Working with joints in Unity so far has been a rollercoaster and we settled on using a chain of spring joints each of which tries to keep a minimum distance to the next joint. I might go into more detail about how the dogs work if anyone is interested? Currently we are experimenting with gameplay to implement a variety of physics based minigames that have players co-operate, we also have a multidog mode in mind for more than two players. This is the first longer term project the three of us have worked on as a team having previously only made game jam games like Big Wings with some friends. Henry and Doug made the lovely Everything is Peachy which you can grab on steam now! Looking forward to sharing the development process with everyone. Henry and I spent a good amount of time tweaking the physics of the dogs and implementing a grab dash. Either player can make their dog end dash forward using the bumper or trigger, if they hit an object that is grabbable they will stick to it. Henry also created some music which is perfect and wobbly and I look forward to sharing it here when we have a video up at some point. The music is layered so if the dogs haven't received input for a while they will sleep and the music will lose its bass line becoming more mellow. Another fun feature is dog holes which will connect the various levels in the game. Shortly after implementing them I realised they look and act a lot like Mario pipes, that should change once we have more natural looking hole asset. We are hoping to show the game at an upcoming IGDA meeting/play party here in Dundee, Scotland and gather some feedback. Then our plan is to apply for Stugan, a really cool accelerator program which takes place in a cabin in the woods in Sweden! We will be trying to post regularly to our team's twitter over here @BitLoomGames. Thank you for reading! 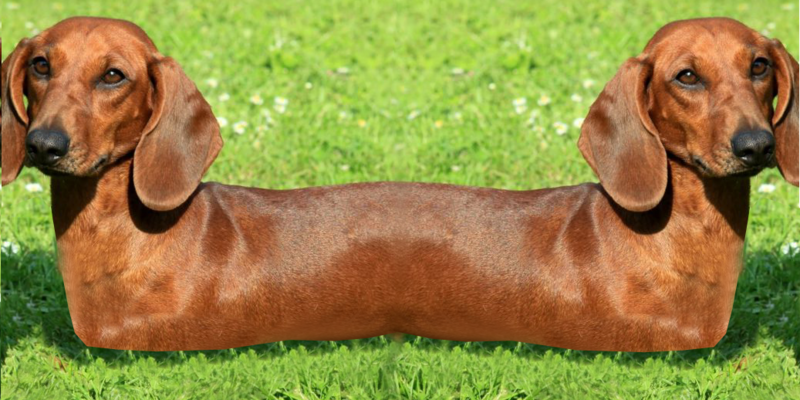 Here is a real life double ended dog. it's like catdog except no cat so it's twice as good. I don't know what photoshop is but I can confirm I have received multiple lawsuits as well as some strange handwritten letters from someone claiming to be a 'double dog preservationist' a little worried they might taxidermy the long windy animal. Another update after a really lovely night showing a little sandbox level for PHOGS at a local IGDA event here in Dundee, Scotland. Everybody seemed to compare it to genital jousting which honestly had not crossed our minds but is a compliment in my book! Some of Dougs animations are in now for the dogs and we added little collars for players to differentiate themselves. One of the biggest complaints we had was about the camera and we have been flipping between an orthographic fixed view and a zoomed in perspective view. The orthographic view gives more information but the stretchy wobbly nature of the dogs is less exaggerated and it is very difficult to gauge any sort of verticality. Henry added a system for wiring buttons together which works well for rapidly prototyping puzzles. Another addition is a bug box with a little face that when moved by a player starts to try and roll back toward its 'home'. Thanks for reading and hopefully in the next update we can show off an early level! The last few days was spent putting together a few level ideas and recording some footage to apply to Stugan which we will be doing in the next couple of days. An idea that went through a few iterations was a little monkey bars obstacle course. Trying to come up with situations where the two players work together is challenging at times as they are literally tied together and so the world needs to compensate for that by having interactions be fairly dense. Another issue we have been struggling with is the camera. The orthographic tests seemed to lose something compared to the perspective view so we stuck with perspective for now. Ahah it looks hilarious :D A lot like Push me Pull you (or something like that), but with 100% more cuteness! Thank you Grhyll that is what we are going for. We started prototyping the idea without really realising what push me pull you is and the initial concept was very similar. When we finally watched some gameplay we removed the sports element and turned it into more of a cooperative puzzle game. We are super happy with the direction it is taking and maybe will still have a competitive mode with more than one double ended dog. Great! Hopefully we can make some interesting ones and get a demo out for people to play. You need to get this picture on your Twitter. It's too good to keep to yourself. Thank you for the enthusiasm! I'll be sure to do that in the morning. Welcome to TIGForum! Development on PHOGS has slowed a little with our university term coming to an end and deadlines looming. We sat down and discussed the world of PHOGS and noted down some neat ideas like the Cloud Factory and tiny huge maze door world. Zero gravity was an idea Henry has and made a little level demonstrating, lasers not shown. We are planning to a apply for the Dare Academy competition run by our university in the next week or so. Hopefully that means we create some more levels and get a better sense of how the structure of the game will work! Until then, thank you for checking out the post. Push Me Pull You was fun but I didn't like the competitive aspect, so yours looks really fun! Also like Katamari Damacy and of course Wobbledogs somehow. That visual style is quite unique, really cool! Thanks Cristiano Vitorino! We should be putting a new devlog up tomorrow.